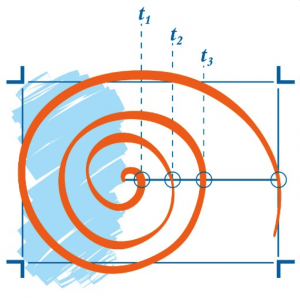 The spiral image symbolizes our understanding of the dynamic, often non-linear nature of projects and what it takes to bring lasting and impactful change to organizations. We start the journey with our clients at the center, and as we make progress, we loop around the spiral through to completion. As we progress through each loop in the spiral, we work together with our clients to prepare for the next phase of effort, honing in on what is necessary, effective, and impactful. The spiral showcases our belief in learning and collaboration. We grow and change our thinking in partnership with our clients. Taking the time to evaluate progress and course correct at each loop leads to meaningful impact, providing a solution that creates value and moves the organization forward. Our application of the spiral image derives from the systems theory concept of the learning organization and from complexity science. We believe in Peter Senge’s supposition that organizations faced with rapid change need to be flexible and adaptable to succeed. These organizations need to create a culture where learning and collaborating on new ways to accomplish tasks is supported and encouraged. At CGS, we help our clients learn and adapt during implementation, to continually improve and better achieve their project outcomes. We recognize that the world has become more complex and change is becoming a new normal for organizations. Traditional approaches to problem solving often fail because they take too long. This is why we consider interventions rooted in complexity science to support our clients in making incremental changes for lasting impact. Applying Glenda Eoyang’s Adaptive Action Model, we take an approach to implementation that allows for learning from an intervention and then adapting for the next.hrough this learning cycle, we identify the incremental shifts that are likely to have the greatest impact. This could mean involving new people in discussions, changing where work takes place, or changing how work gets done.